If one listens to the faintest but constant suggestions of his genius, which are certainly true, he sees not to what extremes, or even insanity, it may lead him; and yet that way, as he grows more resolute and faithful, his road lies. The faintest assured objection which one healthy man feels will at length prevail over the arguments and customs of mankind. No man ever followed his genius till it misled him. Though the result were bodily weakness, yet perhaps no one can say that the consequences were to be regretted, for these were a life in conformity to higher principles. If the day and the night are such that you greet them with joy, and life emits a fragrance like flowers and sweet-scented herbs, is more elastic, more starry, more immortal — that is your success. All nature is your congratulation, and you have cause momentarily to bless yourself. The greatest gains and values are farthest from being appreciated. We easily come to doubt if they exist. We soon forget them. They are the highest reality. Perhaps the facts most astounding and most real are never communicated by man to man. The true harvest of my daily life is somewhat as intangible and indescribable as the tints of morning or evening. It is a little star-dust caught, a segment of the rainbow which I have clutched. Our whole life is startlingly moral. There is never an instant’s truce between virtue and vice. Goodness is the only investment that never fails. Why should we be in such desperate haste to succeed and in such desperate enterprises? If a man does not keep pace with his companions, perhaps it is because he hears a different drummer. Let him step to the music which he hears, however measured or far away. It is not important that he should mature as soon as an apple tree or an oak. Shall he turn his spring into summer? If the condition of things which we were made for is not yet, what were any reality which we can substitute? We will not be shipwrecked on a vain reality. 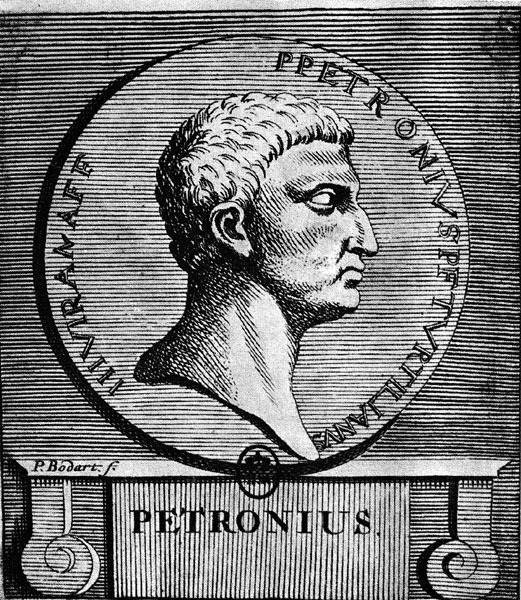 There is something almost poetic in the way that Petronius (27 AD — 66 AD) so succinctly captures a phenomenon that most of us have been through. There are numerous reasons why someone may choose action over the more logical course of inaction — some conscious and others subconscious. We may, for instance, act on bad advice when we haven’t done the work to understand a problem, we may succumb to peer pressure, the idea that ‘everyone is doing it,’ we may follow our hearts (and buy that fancy car we really want instead of keeping the reliable one we have), blindly follow the lead of an expert, or, perhaps most dangerously, we may simply want to appear like we are doing something. We all have moments where we fall victim to the curse of Do Something Syndrome. In fact, the modern organization is full of do something syndrome. The key is to try and realize when we are doing it and back away. Solitude is an important aspect of creative thought. 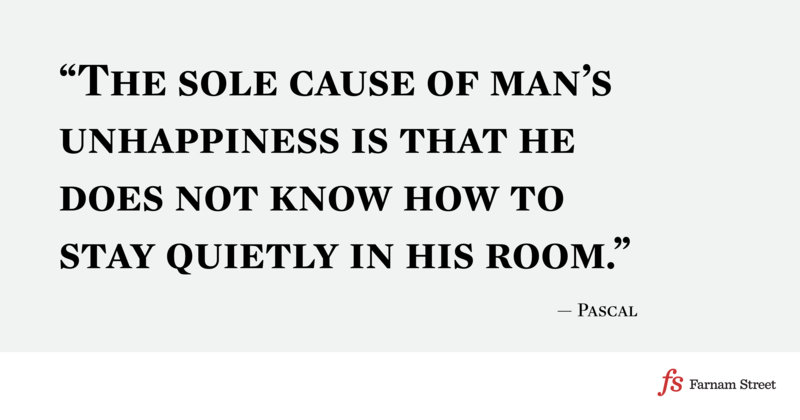 You could make an argument that in our information overloaded world where our senses are stimulated nearly 18 hours a day, solitude and calming our minds is more important than ever. Walking allows us time to play with ideas, explore concepts, and be wrong in our thinking without worrying about others seeing the rawness of our thoughts. I’ve never been a big walker, but after reading Frederic Gros’ A Philosophy of Walking, I became one. I started walking at lunch. I started taking walking meetings and walking phone calls. Not only has it improved my health but it’s clarified my thinking. Walking is not a sport. Walking is not a sport. Sport is a matter of techniques and rules, scores and competition, necessitating lengthy training: knowing the postures, learning the right movements. Then, a long time later, comes improvisation and talent. Sport is keeping score: What’s your ranking? Your time? Your place in the results? Always the same division between victor and vanquished that there is in war – there is a kinship between war and sport, one that honours war and dishonours sport: respect for the adversary; hatred of the enemy. Sport also obviously means cultivation of endurance, of a taste for effort, for discipline. An ethic. A labour. Walking is not a sport. Putting one foot in front of the other is child’s play. When walkers meet, there is no result, no time: the walker may say which way he has come, mention the best path for viewing the landscape, what can be seen from this or that promontory. Walking is the best way to go more slowly than any other method that has ever been found. [T]here is the suspensive freedom that comes by walking, even a simple short stroll: throwing off the burden of cares, forgetting business for a time. You choose to leave the office behind, go out, stroll around, think about other things. With a longer excursion of several days, the process of self-liberation is accentuated: you escape the constraints of work, throw off the yoke of routine. But how could walking make you feel this freedom more than a long journey? … only walking manages to free us from our illusions about the essential. Walking can provoke these excesses: surfeits of fatigue that make the mind wander, abundances of beauty that turn the soul over, excesses of drunkenness on the peaks, the high passes (where the body explodes). Walking ends by awakening this rebellious, archaic part of us: our appetites become rough and uncompromising, our impulses inspired. Because walking puts us on the vertical axis of life: swept along by the torrent that rushes just beneath us. What I mean is that by walking you are not going to meet yourself. By walking, you escape from the very idea of identity, the temptation to be someone, to have a name and a history. During long cross-country wanders, you do glimpse that freedom of pure renunciation. When you walk for a long time, there comes a moment when you no longer know how many hours have passed, or how many more will be needed to get there; you feel on your shoulders the weight of the bare necessities, you tell yourself that’s quite enough – that really nothing more is needed to keep body and soul together – and you feel you could carry on like this for days, for centuries. You can hardly remember where you are going or why; that is as meaningless as your history, or what the time is. And you feel free, because whenever you remember the former signs of your commitments in hell – name, age, profession, CV – it all seems absolutely derisory, minuscule, insubstantial. Sit as little as possible; do not believe any idea that was not born in the open air and of free movement — in which the muscles do not also revel. All prejudices emanate from the bowels. — Sitting still (I said it once already) — the real sin against the Holy Ghost. When he wrote, The Wanderer and His Shadow, he walked, alone, for up to eight hours a day. Nietzsche would stop to scribble notes in small notebooks with a pencil. The entire book, except for a few lines, was thought out and composed en route. Walking is different things to different people. To Nietzsche walking was more than relaxation, it was where he worked best. Kant, by contrast, had a good appetite, drank heartily, although not to excess, and spent long hours at the table. But he looked after himself during his daily walk which was always very brief, a bit perfunctory. He couldn’t bear to perspire. So in summer he would walk very slowly, and stop in the shade when he began to overheat. Rain or shine, Kant had to walk. (Kant) went alone, for he wanted to breathe through his nose all the way, with his mouth closed, which he believed to be excellent for the body. The company of friends would have obliged him to open his mouth to speak. He always took the same route, so consistently that his itinerary through the park later came to be called ‘The Philosopher’s Walk.’ According to rumor he only ever altered the route of his daily constitutional twice in his life: once to obtain an early copy of Rousseau’s Emile, and to join the scramble for hot news after the announcement of the French Revolution. Many people think that walking fast is the key. We’re driven to get from point A to point B and we need to get there as quickly as possible. This is not leisure. Nor is it restful. The illusion of speed is the belief that it saves time. It looks simple at first sight: finish something in two hours instead of three, gain an hour. It’s an abstract calculation, though, done as if each hour of the day were like an hour on the clock, absolutely equal. But haste and speed accelerate time, which passes more quickly, and two hours of hurry shorten a day. Every minute is torn apart by being segmented, stuffed to bursting. You can pile a mountain of things into an hour. Nietzsche, Thoreau, and Rousseau think we should walk alone. Being in company forces one to jostle, hamper, walk at the wrong speed for others. When walking it’s essential to find your own basic rhythm, and maintain it. The right basic rhythm is the one that suits you, so well that you don’t tire and can keep it up for ten hours. But it is highly specific and exact. So that when you are forced to adjust to someone else’s pace, to walk faster or slower than usual, the body follows badly. A Philosophy of Walking explores the purpose walking served to Thoreau, Rousseau, Kant, and more.